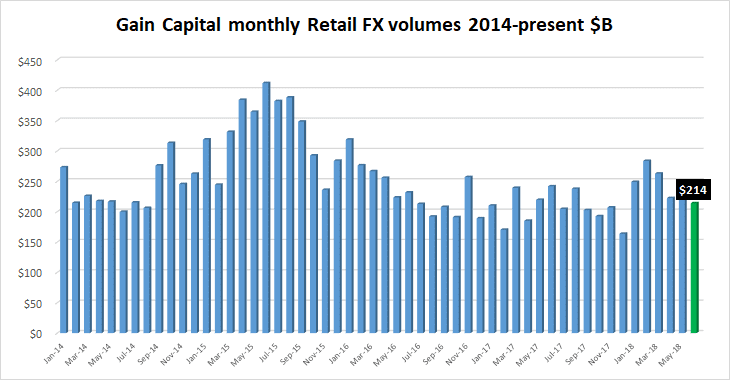 Continuing a string of fairly anemic volume reports we have seen for the month of June 2018 from leading Retail and Institutional FX platforms, Gain Capital Holdings Inc (NYSE:GCAP) has reported that retail volumes – consisting mainly of activity at its FOREX.com unit, as well as City Index – declined by 12% from May, coming in at $213.9 billion. Institutional volumes at GTX were also down, by 22%, to $297.5 billion. However June marks the last month that Gain will be reporting institutional data, as GTX was sold for $100 million to Deutsche Boerse’s 360T, with the deal closing at the end of June. Gain Capital looks like it will be focusing solely on its Retail FX business going forward. Despite the June decline, Gain Capital and FOREX.com had a fairly good first half of the year, with retail forex trading volumes averaging $246 billion monthly, versus just $206 billion in all of 2017. Operating metrics for the second quarter demonstrate our continued progress in executing on our revenue volatility reduction initiatives. The implementation of our new, AI-driven hedging model, which we began rolling out in March, enables us to optimize our hedging activity and reduce variability in our results. These efforts helped deliver revenue per million of $107 during the second quarter. We are pleased with our progress during the first half of the year and, following the sale of our GTX business, feel we are in an even stronger position to continue to drive growth and profitability as we focus on our core retail business.